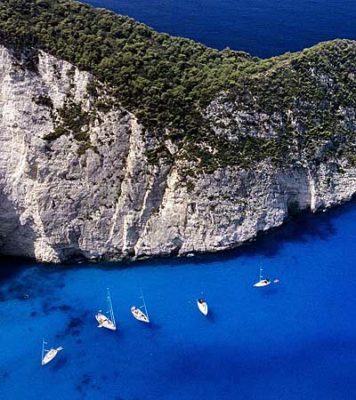 The Ionian islands off the west coast of Greece are surprisingly lush and green (they have more rainfall than England – happily, only in winter), the sailing conditions are generally a gentle force 2 to 4 – not much wind. Ideal for the less experienced, or if you just want to take it easy and it’s great for kids – short distances between islands so no time to get bored. As everywhere in Greece, it’s packed with culture and history, easy to find if you look, from the Venetian city of Corfu to the legendary island of Ithaca, to which Odysseus finally returned after his 11 years of wanderings. Like many, these are the first Greek waters we ever sailed, so the area retains a special something and rewards going back to, many times. For really enthusiastic sailors, we have other ideas. When you look at a map, the Saronic & Argolic gulfs, just south of Athens, look too close to “civilisation” for comfort; too many crowds. Not necessarily. Aegina island is clearly seen from the city, it’s a two hour sail and we know a quiet little port there with the best freshly caught seafood anywhere in Greece (it’s called Perdica) and there’s room in the harbour for all of a dozen yachts, if you’re friendly. The island is dominated by the temple of Aphaia, one of the most important in antiquity (from where the view is wonderful). Many other remains attest to its history, back to the mists of time around 3000 BC. 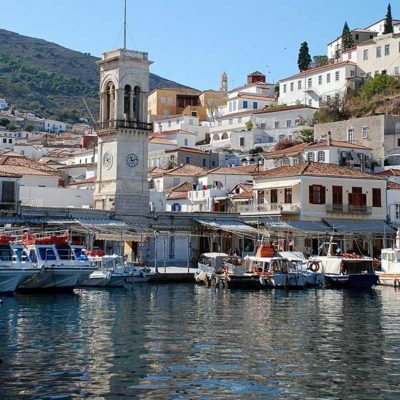 Other gems of the region include the islands of Poros, Hydra & Spetses, none more than 10 miles apart. Sail up into the Argolic gulf and take the short trip to Mycenae or into the small port of Epidavros in the Saronic for the nearby classical remains of the same name. Spirits of ancient times are everywhere. Down the coast of the Pelloponese, notable anchorages include Yerakas, with its fjord-like entrance hiding a shallow lagoon with a Byzantine church keeping watch, and Monemvassia with its ‘sugar-loaf’ mountain houses a mediaeval village and streets just wide enough for donkeys. 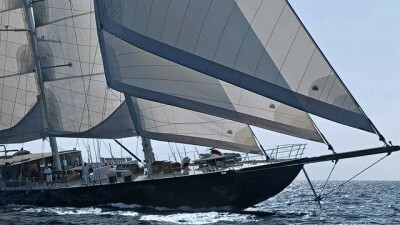 The wind in these gulfs is seldom fierce, but good sailing breezes of force 3 to 5 make for swift passages and, because of the nearby mainland’s topography, the sea is usually pretty flat – arguably the best kind of sailing. You’ll never see all of Greece, but this is a great place to start. For many, the idea of classical Greece means white houses, blue roofed churches, little old ladies in black and the barren islands of the Cyclades (Greek for ‘circle’) in the middle of the Aegean. Magical islands, so close your next port of call is always in view (you’ll have the best charts and pilots aboard, but basically this is easy, just look where you’re going). Easy to reach from Athens (but stop at the Temple of Poseidon at Sounion first) and everything you’ve heard is true. It also comes with a warning for sailors, it’s called the Meltemi, the wind that blows from the north in July & August, reaching force 6 to 7 often, force 8 and more often enough. 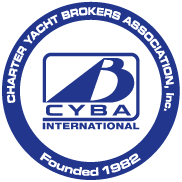 To enjoy this area in summer you need to be an experienced sailor, something of a sportsman, or be in a good skippered or crewed yacht. 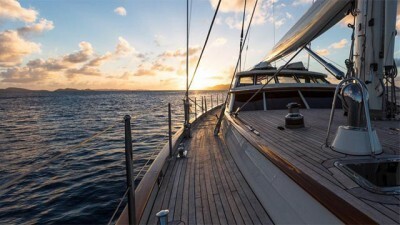 Outside of this two-month period (though nothing is that predictable where the sea is concerned) it’s a different story and you can sail there in more relaxed fashion. It’s worth the journey. 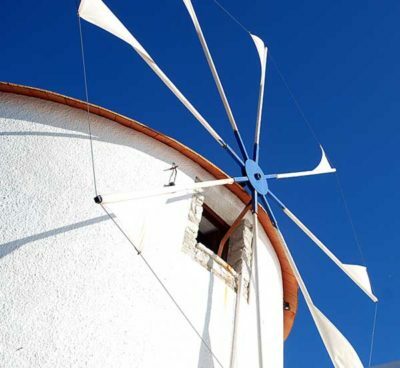 From the mosaics on the island of Delos (ancient, holy place from Mycenaean times, you’ll need a guide) to the windmills of Mykonos and the crater of Santorini (also called Thira, whose volcano blew it apart a couple of millennia ago and gave rise to the legend of Atlantis). Everywhere is a feast for the eye. 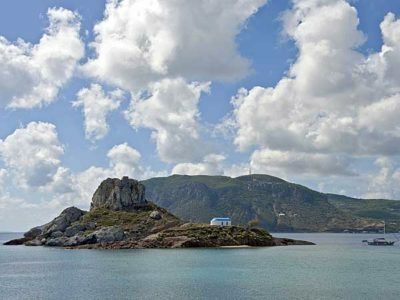 The eastern Aegean islands of the Dodecanese (the name sells them short, there are more than twelve) are like rough hewn pearls of every shade against a dramatic backdrop that is the land mass of Turkey. It’s here that east meets west, before you actually step into Asia, as these islands have been inhabited alternately by the Greeks and Turks – among many others, notably the Knights of Malta who built the magnificent and still completely intact old town of Rhodes in the 12th century – and the culture of the islands reflects these two predominant influences strongly. The climate can be surprisingly mild, so far south, the islands vary from barren rock to cultivated green and the wind evolves from the Cycladic northerly, coming from the east in the northern islands, backing west towards Rhodes at the southern end of the chain, blowing an average force 4, maybe 5. Nothing to fear, here. The seas are not too big, distances between islands not great and there are ports of every kind, from bustling tourist centres like Kos to specks in the ocean like Arki, east of Patmos, which has about 27 inhabitants, one taverna, and the clearest, cleanest turquoise water it will ever be your pleasure to throw yourself into. There are no ferries here, without your own boat you can’t go. Simple.